Crowns are an excellent treatment option for teeth that have had a hard life, such as teeth with many fillings or teeth which have had Root Canal Treatment. By encircling the tooth and tightly fitting to it they hold the tooth together and can greatly extend the lifespan these teeth, allowing you to hold on to a full set of natural teeth. 1. Broken tooth either through decay or fracture requires crown. 2. Tooth is reshaped to allow placement of crown. 3. Crown fabricated in lab is cemented into place protecting the underlying tooth from further damage. Additionally for teeth which have a poor appearance and/or have had extensive wear due to grinding or acid wear, crowns can be used to rebuild the shape of your teeth improving their appearance and re-establishing a stable bite. A tooth that has had many fillings and or large fillings. For a tooth that has developed cracks in it's structure. To restore the aesthetics of a tooth that has become discoloured. To strengthen a tooth which has had a Root Canal Treatment from fractures. To reshape a tooth with a poor shape. A porcelain fused to metal crown is a good mixture of strength and aesthetics. It requires a medium amount of tooth reduction to fit over the tooth. The inner structure of the crown is a gold alloy which gives the crown its strength, whilst the outer is covered in a porcelain layer to give a great aesthetic result. These are the most common type of crown that we construct, they are quite suited to back teeth which are visible in the patients smile. Full porcelain crowns are a newer innovation in dentistry, they can often provide a highly aesthetic result for patients and are especially good for front teeth where aesthetic qualities they bring such as natural translucency is at a premium. A downside of these type of crowns is that to obtain the same strength they are required to be thicker and thus require a greater amount of tooth reduction compared with a porcelain fused to metal crown. It is important that you speak to your dentist so we can walk you through the specifics of how these and other crown types may fit your situation. Gold crowns are made from a gold alloy, technically they are an ideal crown because they require the most minimal reduction in your natural tooth structure. However patients may choose not have these as they have no outer covering of porcelain to give them a tooth like colour. 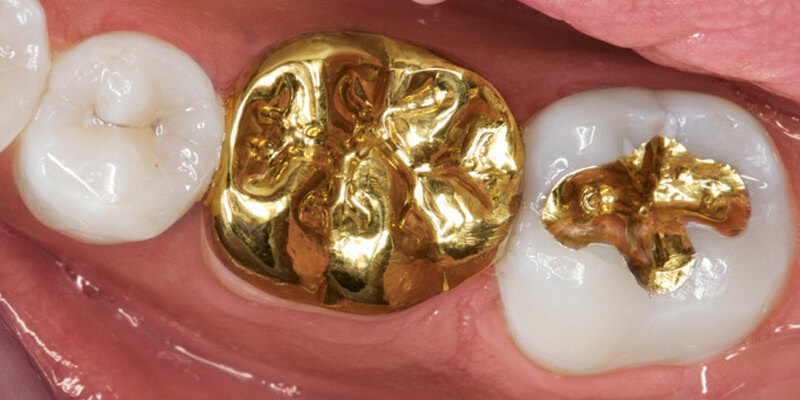 Gold crowns can often be a good choice for back teeth in patients who are not overly worried about the aesthetics of a gold coloured tooth, indeed some patients like the appearance of their gold crowns. They are also quite resistant to further decay and issues.